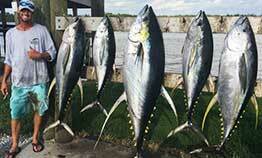 Venice, Louisiana has been holding up its reputation when it comes to inshore fishing. We have been picking up a mess of Speckled Trout along with a quick limit of Red Fish . I have been hitting the Breton Sound area hard and its been paying off. The Cobia are also in full swing we picked up two in the 40 lb range while trout fishing. The river is starting to look right and with the trout moving up the clear green passes this month and into next, the fishing should be second to none very soon.